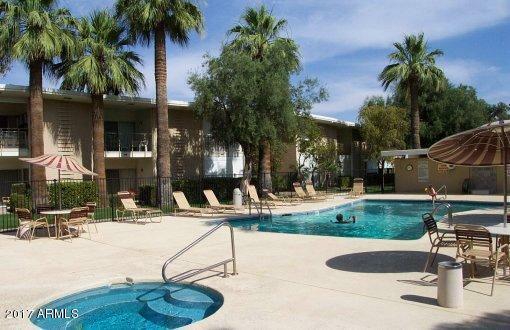 Welcome to Scottsdale's ''Hidden Treasure'' Comfortable and well-located rental opportunity. 1 bedroom condo with spacious feel, high ceilings, large balcony for enjoyable outdoor privacy and peace - lovely sunsets. Fresh paint, new Bedroom carpet. Condos set back from street. Behind Scottsdale Office Bldg. Elevator rare for 2 story. Laundry room basement location accessible by elevator. Lush, mature landscaping in park-like inner lawn and pool areas. 2 pools and spa - one pool heated, one not, for year round swimming. Condo can be rented partially furnished, if needed, or unfurnished. Plenty of storage in condo. Near Old Town Scottsdale, Fashion Square, Scottsdale Center for the Arts, Waterfront. Walk or ride bike along the Canal - park and tennis down the block. Great place to live.